Passport books are designed for use with Linda’s speaking or training programs, as bonus gifts to attendees, to complement your development activities and/or as stand-alone internal resources for your leaders and high potentials. Most of customer service is common sense. You know excellent customer service when you experience it and you also have encountered bad experiences when dealing with service providers. Excellent products and services at competitive prices are expected in today’s marketplace. The deciding factor between using your company and using a competitor usually comes down to the relationships built and how the business makes the customer feel. Quality customer service is that distinction. Now is the time to be AT YOUR SERVICE. The truly successful aim at lofty goals. They rise to meet the occasion, whether opportunity or adversity. The truly powerful achieve more than success in business. They implement a code of conduct in which ethics and responsibility to family, community and others is as important as financial or social acclaim. What follows are discoveries that work for others and bullet points to apply to your life, if you choose. Everything you have obtained, each achievement and the success you’ve experienced to date has been due to decisions you have made along the way. Decide if you want to change anything and then take action. Now is the time to Meet the Challenge! Be A Star Performer is designed to help you develop yourself to your full potential. It will encourage you to discover more about who you are. It will challenge you to learn and practice new skills guaranteed to polish your STAR qualities. It will help you develop others with positive motivation, feedback and encouragement. It will provide words of inspiration and tools that you can use during the tough times everyone, no matter how successful, faces. Now is the time for you to BE A STAR PERFORMER! A good conversationalist makes friends. A gracious conversationalist can win sales, earn promotions and lead winning teams. In today’s high-tech and competitive world, those who can carry on a conversation stand out and draw others to them. Asking questions, listening carefully and indicating genuine interest is rare in our fast paced lifestyle. 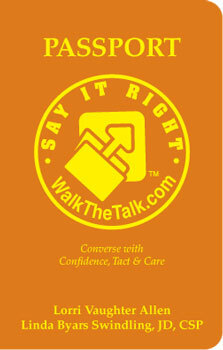 Tact, concern and carefully chosen words are gifts. A flowing, fascinating conversation is like a good book or a lovely melody— it engages and delights but ends much too soon. The good news is that you can upgrade small talk to meaningful dialogue. You just have to SAY IT RIGHT! Whether you are speaking at a team meeting or making a formal presentation to a large audience, Speak to Success will help you be more prepared, more confident and more successful. 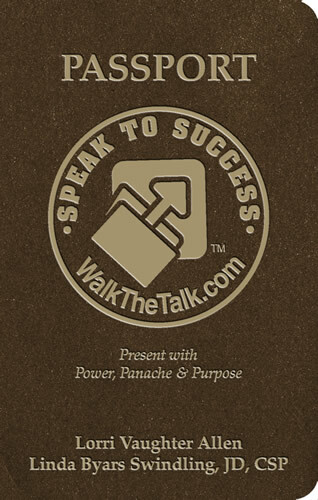 It’s time to SPEAK TO SUCCESS!! We’re confident that once you read this powerful resource, you’ll want to provide copies to everyone in your organization! This clever and concise passport is designed to help you as you take your journey through change no matter what that change is. It will challenge you to think and act differently than you have before. It will provide practical and tactical tools for you to use, words of inspiration when you need them, and advice to follow along the way. Now is the time to DO CHANGE BETTER! Build a more satisfying career? Maybe start your own business? Or perhaps just create a more comfortable life for you and your family? If you answered "yes" to any of those questions, this book is for you. Your roadmap has arrived! The title says it all! Goals keep this journey through life interesting and help us in our attempts to stay in control of what is controllable. Think of a goal as a desired destination. Planning is a roadmap to help chart your personal and professional path. When you set appropriate goals, you have a dramatically better chance of realizing those results. Reach Your Goals was designed to help set goals and vet them to decide which are appropriate for you. It is created to help determine which goals can be met and which can assist to net you more of what you want. Best wishes on your travels to REACH YOUR GOALS!